Hey everyone! Brook here. I wanted to toss a little knowledge your way about Facebook marketing and using the network to your adventage as a business owner. Being the 2nd most trafficked website (right after Google), Facebook can really hit it out of the park when it comes to exposure for your business. But Facebook’s ad game isn’t as easy as it appears. Sure, you can ‘boost’ your post to reach more fans, but are you targeting the ones who are actually going to buying your products/services? We’ll let you in on a little secret, not everyone needs or wants you have to offer. And don’t forget, just because Facebook is where a lot of your leads are spending their time, doesn’t mean they want to see annoying advertisements. 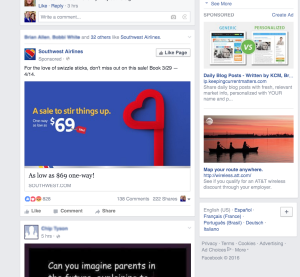 Until recently, most Facebook ads were about as subtle as sandpaper and as welcomed as your mother-in-law tagging along on a romantic vacation. When people are catching up with their friends, they don’t want to be blatantly pushed to buy your wares. Of course there is no denying Facebook’s unrelenting popularity and establishing a good rapport with your leads through this network is definitely brilliant. But how can you know if your ads will be welcomed or shunned? The last thing you want to do is upset potential customers. As an advertiser on Facebook, you have to find a welcoming way to slide your ads into the mix, getting them noticed without disturbing the flow. Because, what good is an unnoticed ad? The key is to show advertisements to people in a way that enhances their social experience, in a way that doesn’t make them feel like advertising victims. Thanks to native ads, advertisements that look like regular content from from friends, it’s becoming a little easier. Native advertising gives you the perfect placement, now it’s your turn to pick the perfect audience, you know, the ones who won’t be annoyed seeing your ad. First, a visitor views your website while shopping or browsing but they leave before buying anything. Here’s where it starts getting fun. During their visit, your website places a pixel or cookie in their browser that tracks what pages they visit. With this helpful information being collected, you can now use retargeting efforts and display ads to your lead’s Facebook timeline that look like just another post from a friend. The ad even shows that over 30 of my friends have “liked” the company’s page. If I didn’t already know this company, I would get an instant feeling that they are legitimate because so many of my friends ‘like’ them. Notice the ad placement, right in the middle of my news feed, sandwiched between posts from my friends, it’s not really intruding or bothersome. On top of that, it’s actually relevant to me because I am in the market for a flight. Their offer for $69 flights is really enticing and got me to click to see if my destination was on the list selected for the sale. This is the type of personalization available when using retargeting and native Facebook ads.